Saints fans aren't happy with the NFL after a controversial no-call in Sunday's NFC championship game. 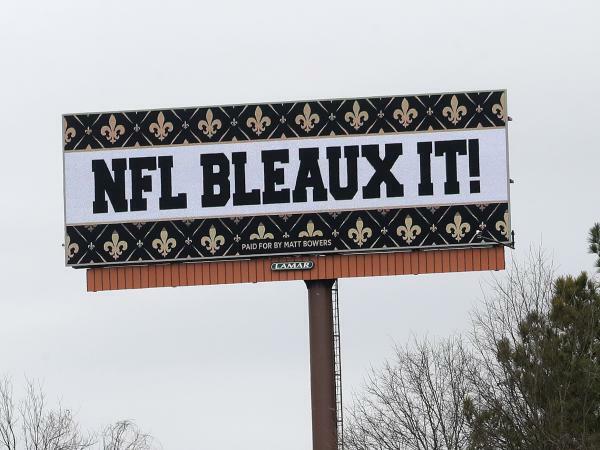 One fan took out several billboards around Atlanta with his message for the league. As the ball sailed toward Saints receiver Tommylee Lewis, Rams cornerback Nickell Robey-Coleman knocked into Lewis, appearing to make helmet-to-helmet contact. Officials called no pass interference or helmet-to-helmet penalties. As a result, the Saints kicked a field goal, then the Rams tied it up, and the game went to overtime – where the Rams went on to win, 26-23. "I don't know if there was ever a more obvious pass interference call that ... you know, that here it is, the NFC Championship Game. So, a tough one to swallow," Saints head coach Sean Payton told reporters after the game. "We'll probably never get over it," he added. Payton wasn't the only one struggling with the outcome: Saints fans are taking their fury with the NFL to court. Two Saints season-ticket holders are suing NFL Commissioner Roger Goodell and the league for a range of damages, The New Orleans Advocate reports, including mental anguish, emotional trauma, "loss of enjoyment of life" and "distrust of the game which has become the National pastime." The lawsuit, filed in Orleans Parish Civil District Court, also claims as plaintiffs "Who Dat Nation." The lawsuit is just one of many outlets for disgruntled fans. One gambling outfit in New Jersey announced it would refund some bets made on the game. Commentators started pointing to sections in the NFL rulebook that might theoretically be grounds for Goodell ordering a do-over of the game's last minutes. A Change.org petition attracting more than 600,000 supporters demanded a rematch: "It's the only fair solution to this travesty of epic proportions." Even Harry Connick Jr. – Harry Connick Jr.! – was so upset about the treatment of his beloved Saints that he Instagrammed a letter he'd written to Goodell, pledging to watch neither the AFC championship game nor the Super Bowl. "I have 8 total so any suggestions are welcome," he wrote on Facebook.